Updated: 1st Feb 2011; This location had closed according to Urbanspoon.com. Bo is now located at 2546 E. Hasting, Vancouver. I just gotta see for myself what this hype was all about. When a group of pro chowhounds goes crazy in the forum over a particular food, it has to count for something. After having tasted something that costs about $5, they are yearning for more. They are even talking about throwing in $50 each to the chef to cook for them. From the way I read it, everything that the chef creates, will turned out to be a winner. They had already been surprised by the chef weekend after weekend when the chef concocts something new. So … I just gotta see for myself what this hype is all about. And all these is happening in the most unlikeliest of places. All these is happening starting from one dish — Laksa. Unless you live in the neighborhood, you will never walk into the Joyce-Way Food Market to buy your grocery. Even if you do, you will not even think they have an eatery in it. 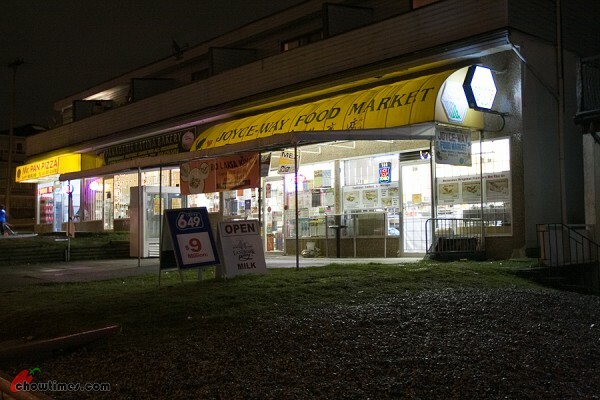 This convenience shop is located on Joyce in Vancouver. It is just a short walk north of the Joyce Skytrain station. Word has it that some Aussie chowhounds stumbled upon this place and before you know it, the Vancouver chowhound community were scrambling over each other to check it out. All came out liking what they tasted. IF … Even if … even if you went into this convenience shop, there is not sign of an eatery. It is tucked in a hidden corner. You gotta walk around some of the grocery display to see it. 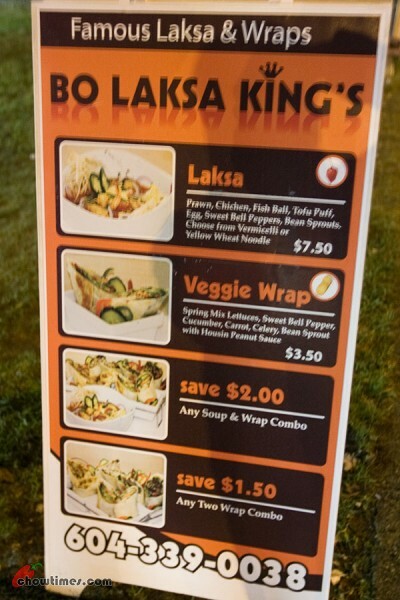 The only hint you will see here is the orangey sign outside that says “Bo Laksa Kings’ – Famous Laksa and Wraps”. The Bo Laksa Kings’ name got into the chowhound circuit initially because of their Laksa. No one really cares for the wraps. What really gets the chowhounds interested is what that is not on the menu. Ladies and gentlemen … presenting, Bo Laksa Kings’! Oh yeah, it is just a counter. It is mostly mean to be a to-go place. After all this is in a convenience shop. For good measures, they have two tiny round tables with four folding chairs if you so chooses to eat in. There is even ONE stool by the counter. Even the cutleries are cheap looking. I was looking at the spoon and thinking to myself that it’s too small for Laksa. All these add to the intrigue of Bo Laksa Kings’. Chef Bo was not around. His lovely wife was. It was just slightly past 4PM when Suanne and I were at the counter. We only planned to get a bowl of Laksa to share between the two of us. We just wanted to try the Laksa and the go for a real dinner afterwards. It was an odd setting. 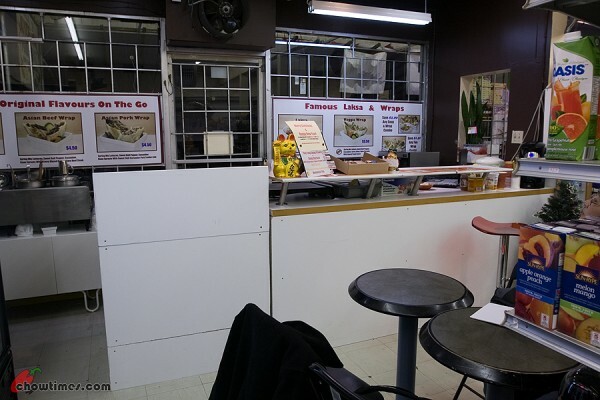 You can see for yourself what the ambiance and decor Bo Laksa Kings’ has to offer. The odd customer walking into the last aisle ends up … peering over our shoulders to see what we’re eating. It’s unnerving. Besides all that chatter on a couple of chowhound forums, there is only one review I found on Yelp. Nothing on Urbanspoon. Nyada on Dinehere.ca. Mrs Bo served us the Laksa in two separate bowls — one for the soup and another for the noodles and stuff. It is the first time we had it served this way. 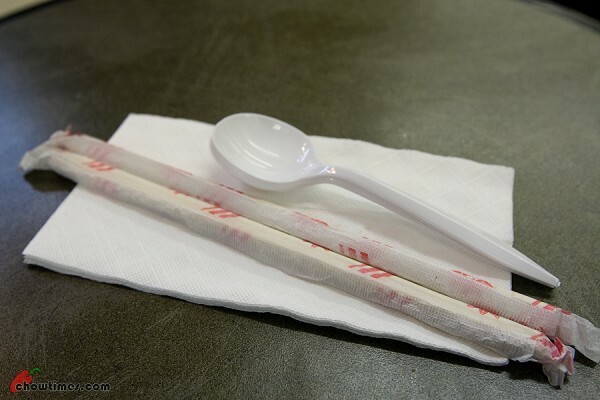 Normally they are served together — just like you would with any soup noodles. Mrs Bo explained that these are normally for take outs and they wanted to separate it so that the noodles does not turn soggy sitting in the laksa soup for too long. This according to Mrs Bo, is the Malaysian version of Laksa. Mrs Bo said that everything they serve here is fresh. It looked fresh. It even smelt fresh. For $7.50, it was a large bowl with a chockful of ingredients. There are prawns, chicken, fish balls and tofu puff. What is missing is the cockles. The best laksa in Malaysia normally has these succulent clams but I had never seen it here in Vancouver. If someone could point me to where I could buy it, the next time I will bring my own cockles and add it to the Laksa. 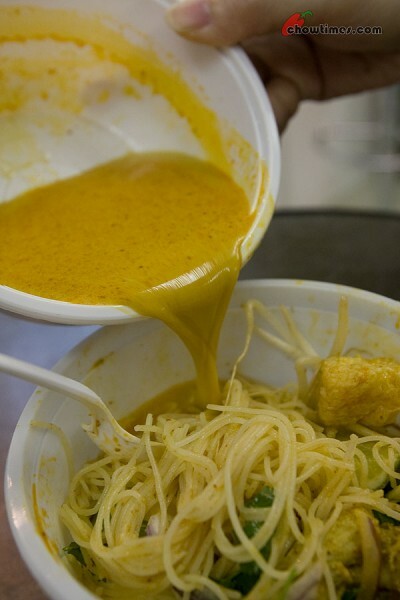 Look at the richness and smoothness of the Laksa broth. 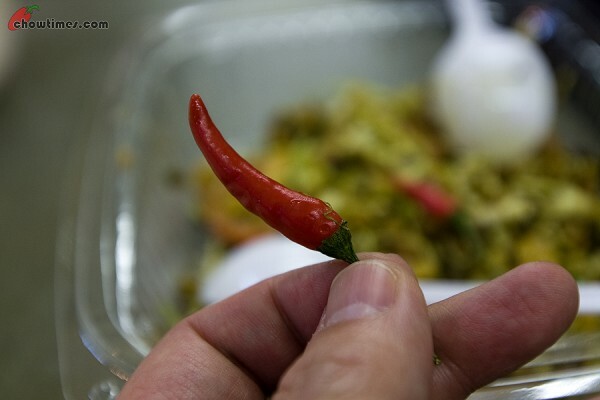 It is spicy hot. Suanne thinks that it was not too hot but I swear it leaves a lingering heat in the mouth for sometime. The richness of the broth is from the coconut milk. For the noodles we opted for vermicelli. We could have the yellow noodles but Laksa is always great with vermicelli. I noticed that they cook and soften up the vermicelli in the Laksa soup because it has laksa stains all over it. Even without the laksa broth, the vermicelli tasted great. We split the one order into two bowls. Suanne does the splitting. Guess who ended up with the bowl with the most Laksa curry? Bo’s curry laksa still can’t stand up to the curry laksas from Malaysia and Singapore. It is not in the quality but the absence of hard to find ingredients like cockles. But I will say that Bo have one of the best, if not the best Laksa in Vancouver. You just gotta try it. One other main ingredient missing in Bo’s version of curry laksa is eggplant. When I was in elementary school in Malaysia, I studied in a school call the Methodist Boys School which has a proud tradition of producing leaders in the country. It is situated at the edge of Chinatown. I often go to this one stall on one of the back lanes called the Madras Lane where I had the best Laksa ever in this planet. They serve it with eggplants and cockles. Oh Yum! I wonder if they still exist today. Bo is Burmese who had worked in several countries in South East Asia. This is where his cooking is based on. On weekdays, he serves primarily Laksa and wraps with a few specials like roti canai and satay. But during the weekends, that is when the specials gets rolled out. I read that he cooks something different each weekend — mostly Burmese. I gotta come back and try it someday soon. The chowhounders were so impressed with these weekend specials that they are seriously thinking of paying $50 each to Bo to do a Burmese Omakase of sorts. That should be fun as there are no Burmese restaurants in Vancouver as far as I know. BTW, Bo has just started four months ago. So they are pretty new. The above is another dish that people are raving about. It is called the Pickled Tea Leaves Salad. 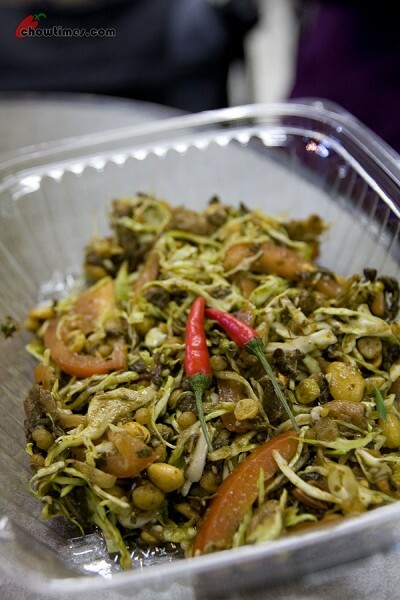 It is a Burmese salad. Mrs Bo said that the pickled tea leaves used here were marinated for at least 6 months — sometimes even up to 10 years. A single order of this is $8. The taste is unique. It is sourish and crunchy at each bite. The moment we took the first spoonful, we couldn’t stop. It is addictive. In it is some fried beans, peanuts, sesame seeds, cabbage, tomatoes, dried prawns and lime juice. And … birds eye chili for those who wants an extra kick. For those not familiar with this, don’t ever pop the whole thing into your mouth! You are supposed to nibble a bit off and eat it with a spoonful of the salad. Boys and girls, I think it is worthwhile going out of your way to check out Bo Laksa Kings’. Don’t take our word for it but at least pay attention to what the chowhounders are raving about. At this rate that the reputation of Bo is spreading, things will change and frankly, I am afraid it might not be for good. Mrs Bo said that they are thinking of expanding and if they do, maintaining the quality of their food is easier said than done. If you do try it, please let me know what you think. Suanne and I love the Laksa and will go check out their weekend specials someday soon. I am an old boy of MBS as well and my mum introduced me to the curry laksa at Madras Lane. It is still one of the best in KL! I don’t necessarily like the stench because it is next to a market but it’s my to go place for lunch after tuition classes. I need to try Bo’s laksa very soon. Went down there for lunch today. The laksa was very good. Too bad, I was in a rush. I should have taken my time to savour the delicious broth. There a small restaurant in the food court at Richmond’s Pacific Plaza mall. It’s called “Gee Taste’s Good”. I think their laksa could give Bo’s a run for his money. It really does “taste’s good”. Went by today because I was craving some laksa, but ALAS, they were closed! Is Tuesday their off day or are the sutting down some days of the week to tend to the new Hastings location?? Looks like the person they hired has been trained well. I went last time and it was only her there but it tasted just as good as the last time when I went with Bo and Tiffanie there! Just went to Bo Laksa on Tuesday, and ordered the Seafood laksa and the chicken roti wrap. It was so good, my mouth watered when I smelled the soup and when I ate, it was like heaven, slightly spicy and deep in flavour. The roti was soft and had a spicy curry like taste with a vinegar and hot sauce to go with it. Will visit again. JS and I went to eat here for lunch today. I definitely like these no-nonsense, honest places; have to support these type of businesses. We also had the laksa and the pickled tea leaves salad. And it was I who split the laksa, LOL. I forgot that you mentioned they had weekend specials. We didn’t know, so we didn’t get to ask about those. Too bad! I wonder if those are available during the day, or only for dinner. Thank you for the review. I went and try out their Laksa on Saturday and LOVE it! Mrs. Bo is very friendly and she told me that they will have a new/additional menu soon! I just drop by today! I got a laksa and asian pork wrap combo for $10. The wrap was wonderful with the sweet sauce. I was quite surprised that I enjoyed bean sprouts in a wrap. Laksa will be lunch tomorrow! From my tasting, the soup was very flavourful with the spiciness coming on gradually. Not bad at all for a spice-wimp. This place is so cool! 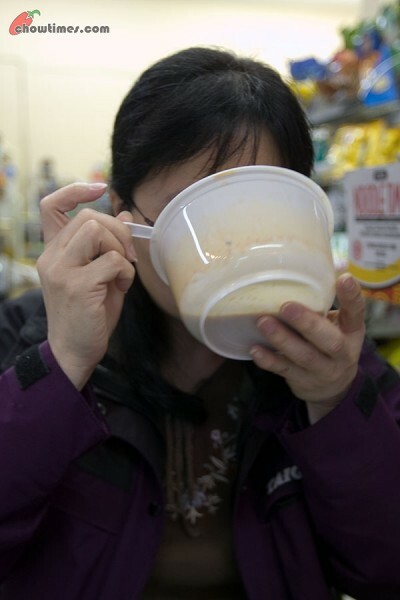 I only knew about it from reading your site – and just tried it this wknd – inside a corner store! It’s delish and a gem! I spoke w/Mr. Bo and apparently he buys all the vegetables FRESH that day and they are organic! He’s opening up a “pan-asian” delivery business that will deliver food til late into the nite. He told me to check his website later on for more details. Unfortunately can’t pick up or dine in. Thnx for all ur food research in town! This place sounds wonderful, I’ll be sure to stop by the next time I’m up from Seattle. How did you find out about the Pickled Tea Leaves Salad, just talking to the folks that work there, or through other foodies? Hi Austin: Awesome site you got there. 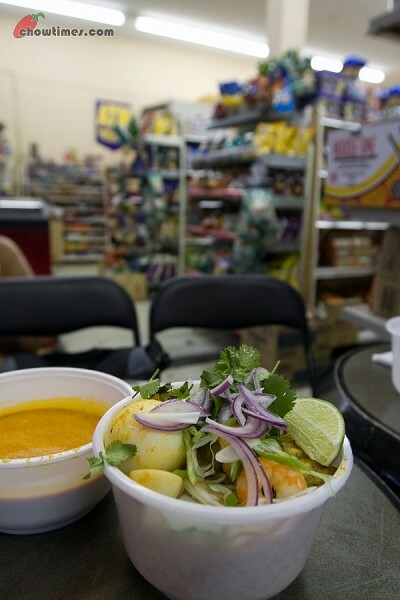 We found out about Bo Laksa King’s from Vancouver area chowhounds. They are the best sources for good eats — much better than restaurant review sites like Urbanspoon/Dinehere.ca/Yelp if you ask me. Thanks! I trust foodies far more than crowd-sourced sites, by default. I do like to cheat and use urbanspoon to find the foodies in cities before I visit, since they link to food blogs. Keep up the awesome eating/work, I know I’ll be reading. I have been meaning to stop by since I first saw the sign placed outside the store but never seemed to be in need of a meal at the time. Last night with enough leftovers for hubby, I said I’d go and pick up something for myself. He doesn’t like Laksa because it is too spicy for him but I made him taste and it wasn’t too spicy for him. We also tried the salad but I found it a bit too salty. It wasn’t until I had it with jasmine tea that the flavours mellowed and bloomed. I am more partial to any fried little bits like the garlic and crunchiness of the beans. As for many foods I may initially dislike, I’m sure it be another one of those items that I will crave and gorge on in the future. Thanks again for the recommendation. I am always looking for small little places like this to eat. The laksa was delicious and not oily and the roti canai were made fresh. It was enough for two small meals. I also tried the burmese pulled tea which is a new thing for me. I like it sweeter like HK milk tea, but perhaps that’s because they were running out of condensed milk. Next time, I want to try the burmese tea leave salad which sounds interesting. We tried Bo Laksa King based on your recommendation, and man! What a find! Definitely one of the best laksas in town. It’s rich without being too heavy, which seems like an impossibility. Mr. Bo mentioned that he’s starting up a website in late January for delivery service. Apparently he’s commissioned a restaurant and will be serving from 6pm to 2am. Also mentioned that there will be a beef randang in the near future. Oh wow, Giorgio … for the person behind “All Thumbs Down”, I sure did not expect a thumbs up from you. This is a rarity! Glad you liked Bo’s Laksa. Loved your site BTW. It’s funny and interesting. 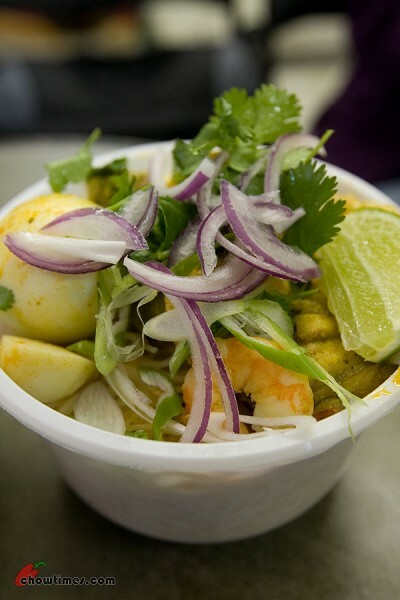 I do like Bo’s laksa, but I think the best laksa in the lower mainland is definitely at Malaysia Hut in Surrey. I lived in Malaysia for 20 years and their laksa transports me back home everytime I have it. Great review Ben & Suanne I love how you write about these little gems! A shout out to el_lobo_solo who is the first to scope this place out. Great find. Also (correct me if I’m wrong), I believe that your reference to “Aussie chowhounds” is actually referring to a older Laksa thread on Chowhound where a Calgary forum member was asking where one could find Laksa like the kind they make in Sydney. (I’ve had the Laksa in Sydney – it is pretty “Westernized”). BLK was first mentioned there. Get it while you can! It is now Chowtimes approved. PS Bo’s made-to-order roti canai – only available on the weekends – is also very good. Gossamer thin layers — pliant without the croissant-like flakey brittleness that you often experience with other roti canai you can get in town. Roti canai and tea leaf salad are regular items now, not just weekends. The roti canai has become one of my fave snacks any day of the week. Hi Fmed: Mrs Bo told me the whole thing started off from some Aussie customer who were living nearby who first put BLK on the radar. But then I think she (and Bo) is not internet savvy and may be referring to what the Chowhounds were telling her … and things got lost in translation in the process. I told Mrs Bo that if she puts up a Tweeter account and announces the specials for the weekends, it could help but I think she does not understand what I was saying. I just left it at that and went back to the Laksa. I’ve seen them knead or shape the dough and plop it down onto the griddle every time. I love the “smash” sound of the bread before it’s put into the container. And I’ve got a crazy amount of BLK containers! As good as the curry sauce is, I may have to experiment, as Bo suggested, with pouring condensed milk onto the roti bread and rolling it up as a sweet treat. This place is near Cucina Manila and the newly opened Goto King. TS if you happen to check it out u can also pass by Goto King. Oh, very intrguing indeed!! Will have to check it out one of these days. Dang–I wish I had known some of this about Burmese food a couple of days ago. A friend from my gym is on her way to Myanmar/Burma as I type this. I would have loved to have told her to check out the Pickled Tea Leaves Salad while she’s there. You should also try the Latina bakery next door! The Georgia Straight did a food critique on their unique beef sandwiches. Also have delicious hot empanadas! Their dulce du leches(sp?) desserts and tres leches cake are to die for too!